Image provided by horseracingphoto.co.uk and is licensed under a Creative Commons Attribution 3.0 Unported License. We here at BET THE STARS know it in our hearts through to our bones that its the Stars the horse is born under that will tell the story of their turf pounding glory. 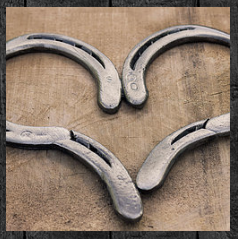 We are going to share with you below how the birth stars' of some famous race horses had measurements in the heavens that pointed to the location where they ran their best and where they carved out their legacy. Below are just a few of the great race horses who we've taken an extended peek at and want to share with you illustrating how their wins paralleled the measurements of Stars they were born under. Will share more with you about other great horses in our blog, but for now, we are hoping to use what we learn to place better bets ourselves, and from time to time, pass that information along to you. ​This page is still a work in progress! So please return. Now let's go look at Secretariat. The planet Jupiter, as the ruler of Sagittarius which is symbolized as the half man half horse, measured 3° of Scorpio at his birth. Big Red was divinely given, by design, the magic of the number 3. It's no wonder, when you include the other planetary strengths in his birth chart, that he was destine to win the 3 races that won him the Triple Crown. 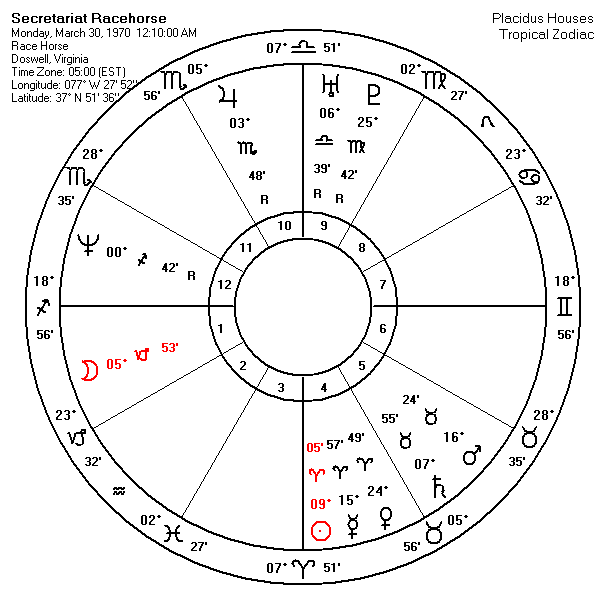 His natal Jupiter at 3° was in opposition to Saturn at 7° in a fixed Scorpio Taurus quadrature at birth, both these numbers are appearing in the year that he won the Triple Crown, 1973. But what's even more interesting is that Saturn's measurement in its total degree of longitude at his birth measured 37°91' ---these are same 4 digits appearing in the year 1973. He was, of course, 3 years old, when he won the Triple Crown, and he also had 3 White Feet. At the age of 19, on November 4th in 1989 at 11:45 AM in Paris, Kentucky those who loved and looked after Big Red faced their their heartbreaking decision to send him home to the stars and put an end to his suffering from a painful hoof disease called Laminitis. Unlike most practices for race horses he was buried whole at Clairborne Farm. Below is an account of all the extraordinary and profound numeric parallels existing between his life as a the greatest race horse and the measurement of the Stars at the time of his birth. 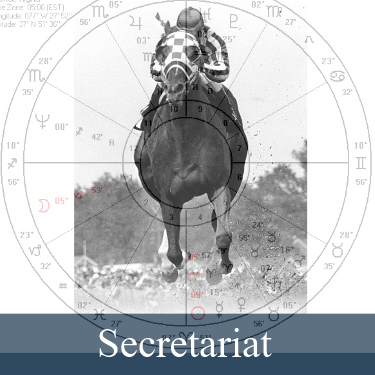 You'll soon see below how Secretariat's destiny was written in the Stars. The map below is an illustration of vectored compass bearings from the point of Secretariats' birth at The Meadow in Virginia that are paralleling the measurement of his natal planets at birth to the Race Tracks where he contended victoriously. Scroll down to the bottom to play with the Interactive Map and the horses in our study.